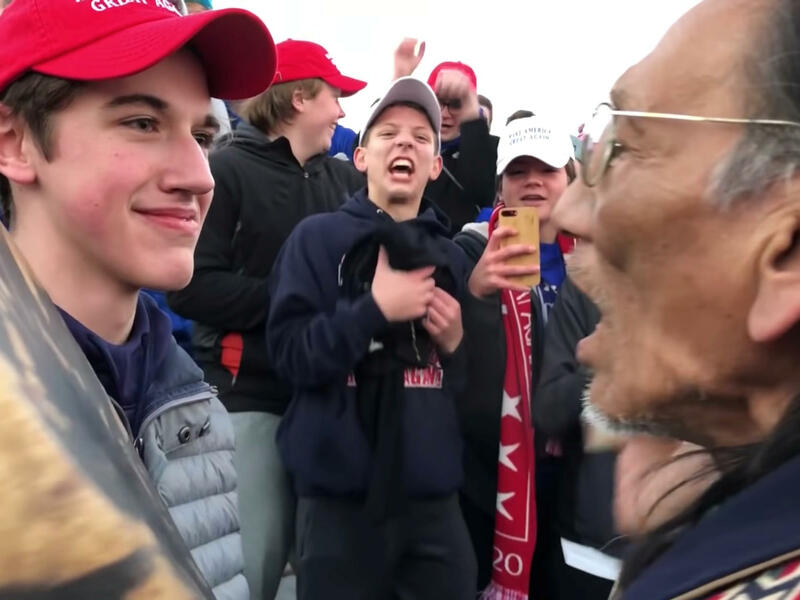 Nick Sandmann, a student from Covington Catholic High School, stands in front of Nathan Phillips, a Native American, at the Lincoln Memorial in Washington, D.C.
Nathan Phillips and Nick Sandmann sparked a nationwide debate after video surfaced of their confrontation on the steps of the Lincoln Memorial. There are myriad perspectives on the event, and reporter Jacqueline Keeler writes that this video "reveals the triumvirate of experiences that largely define American history." Keeler is a citizen of the Navajo Nation and a descendant of the Yankton Sioux Tribe. Audie Cornish of NPR's All Things Considered sat down with her to discuss her reporting following last Friday's events. Audie Cornish: Let's start with the optics of these past few days. The video is released showing Nathan Phillips and Nick Sandmann followed by a strong condemnation of Sandmann, but then an almost mea culpa by some in the media as other videos emerge. What do you think is being lost in this wider conversation? Jacqueline Keeler: I see it as a very interesting moment, a moment where three streams of American experience all met, on the steps of the Lincoln Memorial. We were all coming at this from different directions based on our own experiences that we've had under the system that we live under. For hundreds of years it's been a system of white supremacy that accompanies colonialism, and so you have a group of young men who benefit from that and live in an environment where they appear to not be aware of how other groups view their privilege. And then you have a situation where the adults in their lives have not informed them of how to live in a pluralistic society. We heard Nick Sandmann talking about his intent, what he thought he was doing. A lot of people are reading into his smile and the look on his face. How do you think we should discuss the idea of intent with respect to racism? I think that he should never have never been put in that position to begin with. The adults there should have removed him from the situation. I can't predict how any young person, even a young Native person, would act in a situation like that, having been harassed [by a small group of Black Hebrew Israelites] and then confronted. I think that's the way in which we, as adults, must shepherd the conversation and experiences of young people in a pluralistic society when they encounter things that they have not encountered before. I think it was handled very poorly and if I was his parents I would be angry at the chaperones for putting him in that position. You've been to Covington and have spoken with Native American people in that community. It sounds like you're bringing a lot of sympathy towards the young men in this story; why? I don't know if sympathy is the right term, but I do recognize that minors have a different role. The expectations are on the adults to guide them, but I do note that there is a huge difference in expectation: We have the same folks who are upset about how these boys are being judged, but when young black men are murdered for wearing a hoodie, they expect them to be able to negotiate that space much more carefully, right? When they are paying for their choices with their lives. Either that expectation is applied equally or isn't applied at all. From where we are now — what are the next steps? What can people, on all sides, come away with? The next steps are beginning to understand the Native American perspective to a much greater degree. The AIM, American Indian Movement, and the Greater Cincinnati Native American Coalition, what they wanted to speak to the diocese about was that they wanted the Catholic Church, in particular, to recognize its role in the harms done to Native people. Like the boarding school systems where children were abused for speaking their language and for their culture, and were abused sexually. It's an intergenerational problem. Native people are dealing with a lot of trauma that's been done for generations to their family members, and they're not able to operate in the way that they could have if their societies had not been damaged in this way by American policy and by Catholic policy. This morning, Nick Sandmann, the white teen at the center of last Friday's public encounter with Native American Nathan Phillips, went on NBC's "Today" show to give his side of the story. NICK SANDMANN: My position is that I was not disrespectful to Mr. Phillips. I respect him. I'd like to talk to him. I mean, in hindsight, I wish we could have walked away and avoided the whole thing. But I can't say that I'm sorry for listening to him and standing there. CORNISH: What happened Friday between Phillips, Sandmann and a fringe group called the Black Hebrew Israelites has sparked intense national debate, a debate about culture, race and intent. We wanted to hear perspective from the Native American community, so we turn to Jacqueline Keeler. She's a reporter from Portland, Ore., and a citizen of the Navajo Nation and descendant of the Yankton Sioux tribe. I spoke with her earlier and asked her what she thinks is being lost in this national conversation. JACQUELINE KEELER: I see it as a very interesting moment, a moment where three streams of American experience all met on the steps of the Lincoln Memorial. We're all coming at this from different directions based on our own experiences that we've had under the system that we live under. And for hundreds of years, it's been a system of white supremacy that accompanies colonialism. And so you have a group of young men who benefit from that and live in an environment where they appear to not be aware of how other groups view their privilege. And then you have a situation where adults - their adults in their lives have not informed them of how to live in a pluralistic society. CORNISH: We heard Nick Sandmann talking about his intent, you know, what he thought he was doing. And a lot of people are reading a lot into his smile, the look on his face. How do you think we should discuss this idea of intent, especially when people are, you know, talking about racism? KEELER: Well, I think that - specifically addressing the young man, I think that he should never been put in that position to begin with. I think that the adults there should have removed him from the situation, removed all of the young people from the situation. I can't predict how any young person, even a young Native person, would act in a situation like that having been harassed and then confronted with that. I think that's the way in which we as adults must shepherd the conversation and experiences of young people in a pluralistic society when they encounter things that they have not encountered before. So I think that was handled very poorly. And if I was his parents, I would be angry at the chaperones for putting him in that position. CORNISH: You've been to Covington. You've spoken with Native American people in that community. And it sounds like you're bringing a lot of sympathy towards the young men in this story. Can you talk about why and if that's a common sentiment? KEELER: Well, you know, I don't - I don't know if sympathy is the right term, but I do recognize that minors have a different role. It's really that expectations are on the adults to guide them. But I do note that there is huge difference in expectations between - you know, we have the same folks who are upset about how these boys are being judged. But yet at the same time, when young black men are murdered for wearing a hoodie, they expect them to be able to negotiate that space much more carefully - right? - when they are paying with their choices with their lives. And so I think that, all things being fair - that either that is applied equally, or it's applied not at all. CORNISH: From where we are now, what do you think are the next steps? As we mentioned, you've been reporting from Covington. You've talked and heard a lot of people who feel like they have a stake in the story. KEELER: Yeah, I think the next step is really beginning to understand the Native American perspective to a much greater degree. The AIM Kentucky, the American Indian movement, then also the Greater Cincinnati Native American Association (ph) - what they wanted to speak to dioceses about which they did not get to speak to the dioceses was that they wanted the church - the Catholic Church, in particular - to recognize its role in the harm that it has done to Native people - the boarding school systems where the children were abused for speaking their language and their culture. CORNISH: ...People want to have from Native communities. KEELER: Yes - and sexual abuse. I mean, it's an intergenerational problem. I mean, a lot of times people will judge Native people, but they are dealing with a lot of trauma that's been done for generations to their family members. And they're not able to operate in the way that they could have if their societies had not been damaged in this way by American policy and by Catholic policy. CORNISH: Jacqueline Keeler, thank you for speaking with us. KEELER: Sure. Thank you for having me. CORNISH: That's Jacqueline Keeler, a reporter from Portland, Ore. She's a member of the Native American Journalists Association and a descendant of the Yankton Sioux tribe. And a quick note - the correct name of that Cincinnati Native organization she mentioned is the Greater Cincinnati Native American Coalition. Transcript provided by NPR, Copyright NPR.